A pressure transmitter is essential for waterjet cutting, a highly effective and affordable method for slicing through a wide range of materials. WIKA’s HP-2 high pressure transducer enables high precision monitoring at pressures up to 15,000 bar (217,000 psi). A high accuracy of 0.25% full scale ensures end-user part reproducibility, meaning the end-user part is cut with the same precision every time. With the HP-2, users can also enjoy less machine downtime and maintenance. 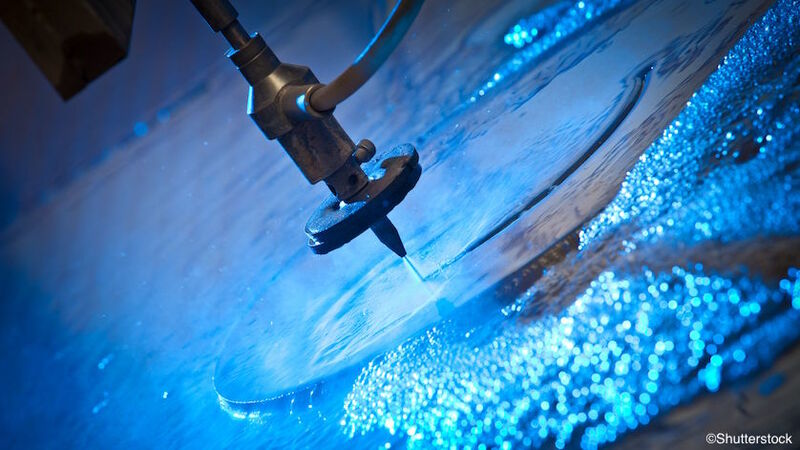 Waterjet cutting is one of the most flexible and cost-effective cutting solutions available today, and using a high pressure transmitter increases its functionality. Connected to a high-pressure water pump, the cutter is easily adjusted for different materials and can cut through almost anything faster and cleaner than using conventional methods. The environmentally friendly, dynamic process eliminates the risk of materials hardening from generated heat, and protects users from exposure to toxic fumes and dust. While using a waterjet cutter, an operator must carefully regulate an enormous amount of pressure. This can be challenging when working with thicker materials. When cutting a chunk of steel, for example, the waterjet stream is further away from the nozzle at impact, which can result in inaccuracies. Fluctuations in the cutting process mean costly irregularities in the end product. Some end users feel they can save money by using a lower-grade pressure sensor, but this is false economy. Inaccuracies are an issue, as are pressure spikes, breakdowns, frequent downtimes for maintenance and part replacements, and disruptions that result in lost productivity and, thus, lost revenue.With a high-quality pressure transmitter like WIKA’s HP-2 pressure transmitter, such problems are rare. Consistent waterjet velocity and distribution is key to repeatability when using this cutting method. The HP-2 pressure transmitter, designed specifically for high-pressure applications up to 217,000 psi (15,000 bar), offers reliable, precise results ideal for waterjet cutting. The robust sensor is built to withstand the rigors of high pressure and provides an extended operating time, even in demanding applications requiring an accuracy of 0.25%. The HP-2 is one of the few instruments on the market today that can reliably measure media pressure at such high-pressure situations, enabling consistent control of process conditions over long periods of time. Users can set the pressure range within a very tight band and operate at their specific psi all the time, every time. The optional Diaphragm Impact Protection System (DIPS) protects the sensor from pressure spikes and pulses by significantly reducing the flow rate through the sensor pressure channel, which changes the flow path to keep pressure spikes from directly impacting the sensor diaphragm. The DIPS also significantly extends the life of the pressure sensor. Customers report that the HP-2 lasts twice as long with DIPS compared to using it without this option. The reliability and longer life cycle result in less machine down time and, thus, greater productivity. Even the sturdiest pressure transmitter will not last forever, and the part most likely to fail in any environment is the process connection. To save end users money, time, and frustration, WIKA offers the Exchangeable Process Connection (EPC) option for the HP-2. If and when this part fails, all that users have to do is to replace one element – a 50% to 75% savings over having to buy a brand-new pressure transmitter. WIKA’s Model HP-2 offers excellent accuracy, repeatability, and reproducibility when using waterjet cutters and other high-pressure equipment. The pressure transmitter’s optional features increase savings even more by prolonging the pressure sensor’s lifetime and allowing for lower-cost replacements. For more information on the HP-2 and other pressure instrumentation, contact WIKA today.